As the final RTM build of Windows 10 May 2019 Update version 1903 is set at build 18362, Microsoft has geared up to fix bugs and issues that may arise in the major feature update. Cumulative Update (CU) KB4497464 is the result of the continue refinement to Windows 10 May 2019 Update Build 18362.1. KB4497464 is rolling out to Windows 10 devices enrolled in the Fast and Slow rings of the Windows Insider Program. The update is listed as the following in Windows Update as the following, together with Servicing Stack Update (KB4497727). Fixed an issue where AAD (Azure Active Directory) users were not able to sign-in after updating to 19H1 on AAD-joined PC not enrolled into MDM. Fixed an issue where users were unable to enable\disable .NET Framework or other optional feature- on-demand (FODs) after installing recent Cumulative Updates. Fixed an issue where a user’s PC may get into a unbootable state after installing a Cumulative Update and then installing a optional feature-on-demand (FOD). The KB4497464 cumulative update is offered to Windows Insiders running Windows 10 May 2019 Update v.1903 on Slow and Fast rings via Windows Update. 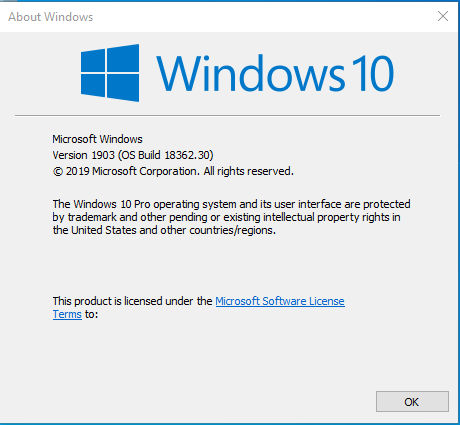 Alternatively, you can also directly download the Windows 10 Version 1903 Build 18362.30 updates from Microsoft’s server if you’re not enrolled in Windows Insiders program and want to manually install the updates.